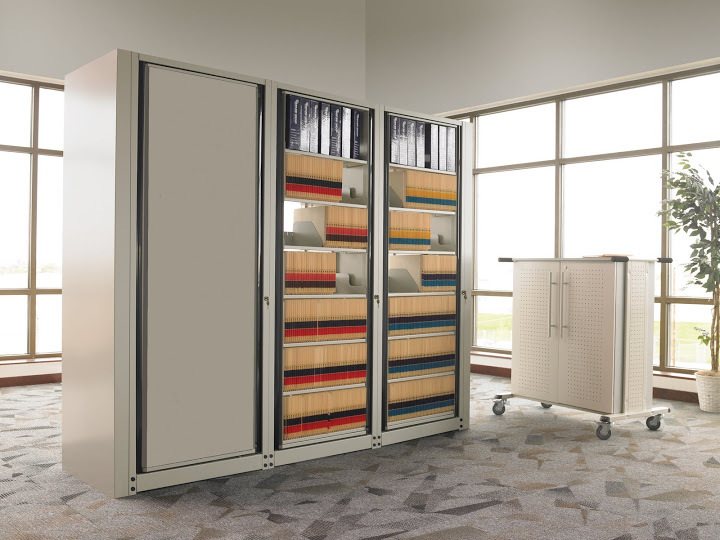 Dimensions: 46"W x 32 1/4"D x 94"
FREE Space Planning and Design Services: Our storage and space planning specialists can help you design a storage and high-density file system to meet your specific needs. Give us a call at 877-878-8770 for a design and price quote. The ARC Rotary File is a double faced unit that rotates easily to provide access to both sides. Using our flexible cantilever style shelving, the ARC provides the most unobstructed filing inches per level and the easiest installation possible. The Complete Starter includes everything needed to house a filing system including the specified number of shelves and dividers. ARC Rotary Files fit where other files won't. Minimal access space is required because no doors or drawers protrude into aisles. Yet you can access twice the amount of material from a single vantage point, compared to conventional filing solutions. There are no cumbersome foot pedals to operate, a slight push is all it takes to rotate cabinets. Each unit has a standard lock to maximize security and peace of mind. Allow 5.25" (letter depth) or 6.50" (legal depth) clearance from wall for rotating carriage. Standard Lock on all cabinets. Empty units can be configured in endless variations for mixed media storage solutions. Complete Units are ideal for storing color-coded filing. Shelves adjust on 1 1/2"H increments; 120 lb. weight capacity per shelf. STARTER UNITs attach to either right or left side of starter unit. To order a fully assembled unit, add the letter B after the letter C in the part number (e.g. ARCB244035). Complete units have slotted shelves with two (2) file dividers per 24" wide shelf; three (3) file dividers per 30" wide shelf. Universal base lets you expand system in either direction. Choose from six pre-configured units or specify your own storage variations. Universal base lets you expand system in either direction. Units are lockable and secure (standard). Options include reference shelf, cantilevered slotted shelf, roll-out drawers, roll-out shelves, roll-out hanging file frames and pass-through shelves. ARC-in-the-Box units shipped assembled. Leveling and shelf/divider installation required. We can design an ARC file system to meet all your LFI (Linear Filing Inch) requirements. Files are equipped with a rotating mechanism that self-locates every 90 degrees. Roll-out drawers to store a variety of letter or legal documents are available in five heights. Optional cantilevered shelf and pull-out reference shelf to ease file notations are available.